Here’s a trendy holiday decorating idea that combines the soft glow of mini lights with the gentle scent of warm potpourri. It’s an easy way to infuse a room with holiday ambience or light up the dark corner of a hallway. 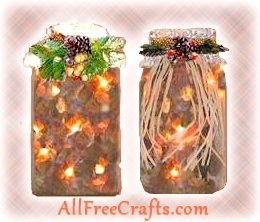 These lighted potpourri jars are such an easy craft that they make ideal hostess gifts for impromptu holiday gatherings. Just wrap in cellophane and add lots of cheerful ribbon curls. I always have one lit up in the bathroom at Christmas because the warm glow serves as a night light for guests while the subtle fragrance is long-lasting and very pleasing. 1. Clean and dry the glass jar, then add a layer of potpourri to cover the bottom. 2. Turn on the lights and begin feeding them into the jar, adding potpourri as you go, so that the lights are spaced equally apart and supported by the potpourri that you are packing around them. Do not pack the jar too tightly. 3. Allow the end of the light string to come out through the top and tuck it to the back of the jar. 4. If you’re using an antique or modern mason-style canning jar, it probably comes with a two-piece lid. You can leave the lid off entirely or just discard the center section then screw the band in place. 5. Fasten a doily or circle of open-weave fabric over the mouth of the jar using a strong elastic band. This will hold the light string in place, as it comes out of the jar, as well. 6. Cover the elastic band with ribbon or raffia. You can tie the ribbon or raffia in a bow, or just knot it together and cover with seasonal decorations. 7. Using tacky glue or hot glue, add a few festive decorations to the front of the ribbon. 8. If you’re giving the jar as a gift, wrap in cellophane and tie with curly ribbon. which complement the original scent. Simply add a few drops of oil through the holes in the doily and your lighted potpourri jar should be good to go for another season.